To Cite: Hui Yun S, Suk Choi Y. The Effects of Dexmedetomidine Administration on Postoperative Blood Glucose Levels in Diabetes Mellitus Patients Undergoing Spinal Anesthesia: A Pilot Study, Anesth Pain Med. 2016 ; 6(6):e40483. doi: 10.5812/aapm.40483. Background: Dexmedetomidine (DEX) is an α2-adrenergic receptor agonist with sedative and sympatholytic effects. It inhibits the stress response and insulin secretion. Therefore, postoperative changes to blood glucose levels were investigated when DEX was intraoperatively infused for sedation purposes in diabetic patients under spinal anesthesia. Methods: Twenty diabetic patients were randomly allocated to two groups (n = 10). Group A patients were infused with DEX at a dose of 0.4 - 0.8 μg/kg/hour and group B (control) patients were infused with the same volume of normal saline. The blood glucose levels were measured preoperatively and at 1, 3, 6, 12, and 24 hours postoperatively. Results: There was no statistically significant difference between the blood glucose levels in groups A and B up to 24 hours postoperatively (P = 0.088). A statistically significant difference in the blood glucose level was not demonstrated 24 hours after surgery in comparison with the baseline level in Group A. 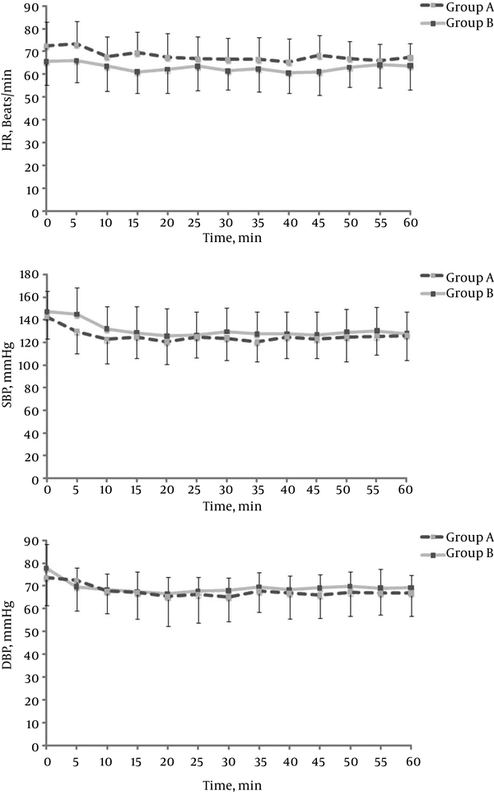 The blood glucose level significantly decreased at three hours in group B in comparison with the level at baseline (P = 0.007) and increased at 24 hours (P = 0.037). Conclusions: An intraoperative DEX infusion maintains blood glucose levels at a constant level relative to baseline in diabetic patients within 24 hours postoperatively. The frequency of hyperglycemia was low in group A in the perioperative period compared with that in the control group (group B). Surgical stress increases the secretion of catecholamines, cortisol, and glucagon by inducing various metabolic responses, causing a reduction in insulin secretion and insulin resistance, thereby altering glucose levels (1-3). Dexmedetomidine (DEX) acts on the α2-adrenergic receptors to induce sedation without respiratory depression and is effectively used to maintain adequate perioperative sedation (4-8). It has been reported that the intraoperative infusion of DEX blunts the stress response (9). The effect of DEX on the stress response is known to be prominent in general anesthesia (10, 11). However, most studies have been conducted on nondiabetic patients or animal models (8, 9, 11-14). None of the studies have clearly reported on changes to glucose levels caused by DEX infusion in patients with diabetes mellitus (DM). Glucose control is obviously critical in this population. Therefore, we investigated the ability of an intraoperative DEX infusion to reduce hyperglycemia and which was specifically used for the sedation of DM patients undergoing spinal anesthesia. Approval to conduct the study was obtained from the institutional review board (IRB No. 2016-02-007). Twenty adult patients diagnosed with DM and American Society of Anesthesiologists physical status II scheduled for elective total knee arthroplasty (TKA) under spinal anesthesia at a single university hospital from July to December 2014 were evaluated. Patients with a history of severe cardiovascular disease, steroid use, renal or hepatic dysfunction, mental retardation, pregnancy, preoperative hypotension, and hypovolemia were excluded from the study. The patients were randomly divided into two groups; group A (n = 10), unilateral TKA with DEX administration (0.4 - 0.8 μg/kg/hour), and group B (controls) (n = 10), unilateral TKA without DEX administration. The patients were admitted to the operating room without premedication, where they underwent noninvasive blood pressure monitoring, electrocardiography, and pulse oximetry. After the initial vital signs were measured, the patients in group A were administered intravenous DEX at 0.4 μg/kg/hour, up to a maximum of 0.8 μg/kg/hour (without a loading dose) and oxygen at 5 L/minute through a mask. A similar protocol was applied to the group B patients in whom a similar volume of saline and oxygen was administered. The intraoperative DEX dose was adjusted to maintain a Ramsay Sedation Scale score of 3 in group A (15). Spinal anesthesia was performed at the L4-L5 or L3-L4 intervertebral space using 10 mg bupivacaine hydrochloride (AstraZeneca, Australia). Surgery commenced when bilateral sensory blockade had been achieved up to the T10 dermatome. Systolic blood pressure (SBP) was maintained within 20% of the baseline when the SBP was ≤ 90 mmHg. Ephedrine (5 mg) was administered intravenously. Bradycardia was defined as a heart rate of ≤ 50 beats/minute. Atropine (0.5 mg) was administered intravenously in cases of bradycardia. Preoperatively, the patients were maintained on 0.9% normal saline at 20 mL/hour and a 5% dextrose in water (DW) solution mixed with 5 - 10 IU human insulin at 40 ml/hour. Only 0.9% of normal saline was administered during surgery. Postoperative patients were maintained with 0.9% normal saline at 60 mL/hour after surgery until the resumption of oral intake. There were individual differences in time to oral intake, based on the absence or presence of flatus, but most of the patients resumed drinking water within 6 - 12 hours postoperatively and consuming food within 12 - 18 hours. All of the patients resumed food intake within 24 hours and concurrently restarted their usual antidiabetic medication. In both groups, the treatment was either 50% DW injection if the blood glucose level was < 70 mg/dL (hypoglycemia) or in the event of hypoglycemic symptoms (trembling, palpitations, anxiety, and sweating). Alternatively, an insulin glulisine injection was administered if the blood glucose level was > 180 mg/dL (hyperglycemia) during the perioperative period. Postoperative pain was managed using a patient-controlled analgesia device containing 10 µg/kg of fentanyl and 300 mg of ketorolac mixed with 0.3 mg ramosetron to a total volume of 100 mL (a basal rate of 1 mL/hour, a bolus rate of 1 mL, and a lockout time of 15 minutes intravenously). Pain was assessed using the visual analogue scale. Tramadol (50 mg) was administered intravenously when the score was ≥ 5. Capillary blood glucose levels was measured preoperatively and at 1, 3, 6, 12, and 24 hours postoperatively, depending on when the surgery was complete, and measured at the fingertip using a portable blood glucose meter. An electrocardiogram was performed, and noninvasive blood pressure, peripheral capillary oxygen saturation, and end-tidal carbon dioxide were monitored continuously during surgery at five-minute intervals. Postoperative pain was evaluated based on supplementary analgesics that were administered within 24 hours postoperatively. The mean serum glucose concentration was determined to be 136.95 ± 19.76 in the control group and 118.2 ± 16.24 in the DEX group one hour postoperatively in a previous study (11). In an earlier study, when injected with DEX ≤ 2 hours, the context-sensitive half-life of DEX was < 60 minutes (16). Thus, we measured the change in glucose levels one hour after surgery. We used a group size of 21 to obtain an alpha error of 0.05 and a beta error of 0.10. Ten subjects per group were required for this pilot study. The data were analyzed using SPSS® software (IBM, SPSS Statistics 21 for Windows®). Normally distributed continuous categorical data were expressed as the mean ± standard deviation and non-normally distributed data as the median value (25th - 75th percentile). Continuous data between the groups were compared using the Mann-Whitney U-test. Non-continuous data between the groups were examined using Fisher’s exact test. A Wilcoxon signed-rank test was used to analyze values that changed from baseline. Repeated measures analysis of variance (ANOVA) was used to evaluate the time-dependent stress response values. A value of P ≤ 0.050 was considered to be statistically significant. The demographic data, surgery, and anesthesia times were similar between the two groups (Table 1). However, the use of additional analgesics was higher in the control group (P = 0.029) (Table 2). Intraoperatively, the heart rate in group A remained higher than that in group B (P = 0.235). SBP and diastolic blood pressure were also lower but the difference was not statistically significant (P = 0.536 and P = 0.669, respectively) (Figure 1). The capillary blood glucose level was not significantly different between groups A and B within 24 hours (Figure 2) (P = 0.088). However, there was a significant decrease at three hours in group B compared with baseline (P = 0.007) and a significant increase at 24 hours (P = 0.037). There was no need to determine whether or not there was a statistically significant change in the capillary blood glucose level compared to the baseline level within 24 hours in group A.
Abbreviations: DM, diabetes mellitus; HbA1c, hemoglobin A1c. Abbreviations: DEX, dexmedetomidine; IQR, interquartile range. aP ≤ 0.050 versus group B.
bBlood glucose level < 70 mg/dL. cBlood glucose level > 180 mg/dL. HR, heart rate; DBP, diastolic blood pressure; SBP, systolic blood pressure; group B (gray line): saline administration; group A (black dotted line): dexmedetomidine administration. Data are presented as the mean ± standard deviation. Group A (black dotted line): dexmedetomidine administration; Group B (gray line): saline administration. The data are presented as the mean ± standard deviation. *P ≤ 0.050 versus group B. †P ≤ 0.050 versus the baseline within the group. The DW solution was administered to two patients in group B with hypoglycemic symptoms, such as anxiety and sweating, (75 and 77 mg/dL, respectively) within six hours. Apidra SoloSTAR® (Sanofi-Aventis Deutschland GmbH, Germany) was administered to another two patients with hyperglycemia in this group (210 and 279 mg/dL, respectively) within 24 hours. However, none of the patients in group A required additional management because of hypoglycemia or hyperglycemia. Acute hyperglycemia is common in the perioperative period in patients undergoing surgery or with critical illness. In addition, a direct relationship between perioperative hyperglycemia and mortality has been established. Maintaining constant blood glucose levels in DM patients is a significant factor in reducing complications (17-19). However, a stress stimulus, such as surgery or chronic pain, induces changes to glucose levels through the stimulation of an endogenous adrenal response. It has been shown in previous studies that the use of an α2-adrenergic receptor agonist blunts this response but the activation of α2-adrenergic receptors inhibits insulin secretion (20-22). DEX is a selective α2-adrenergic receptor agonist with an α2:α1 activity ratio of 1 620:1, which is relatively high (23). Therefore, a DEX infusion has the potential to affect glucose levels but its effect on DM patients has not been clearly identified. 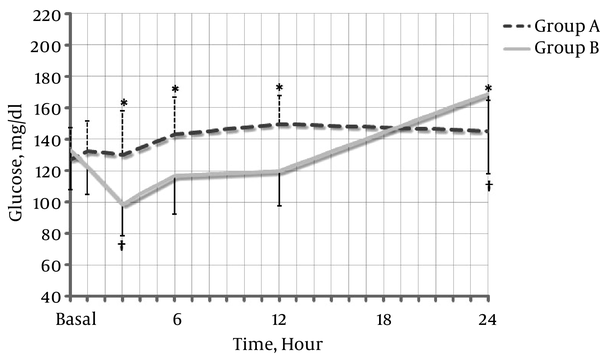 It was found in this study that the capillary glucose blood level was maintained at a similar level to baseline until 24 hours postoperatively in DM patients in whom DEX was administered intraoperatively (Figure 2). It was shown by our results for the DEX group that the capillary glucose blood level was maintained similar to the baseline level during the perioperative period without the occurrence of hypoglycemia or hyperglycemia. The glucose level was controlled within a mean range of 130 - 150 mg/dL for 24 hours in the DEX group in our study. It was verified by repeated measures ANOVA that a significant difference in time was not observed (P = 0.088). However, two patients in the control group experienced hypoglycemic symptoms, such as anxiety and sweating, within three hours, with glucose levels of 75 and 77 mg/dL, respectively (but did not meet the standard criteria for hypoglycemia). Another two patients had hyperglycemia within 24 hours. DEX reportedly inhibits the release of stress response biomarkers (9, 24). Increased serum cortisol increases the metabolism of glucose, amino acids, and fatty acids (25). Generally, blood glucose concentrations increase after surgery. Serum glucose increased over time in subjects in whom DEX had been administered, which may have been owing to the effect of α2-adrenergic receptors on the pancreatic β cells, leading to decreased insulin secretion (7). Generally, α2-adrenergic receptor agonists increase blood glucose levels (26, 27). Reported increases in blood glucose in humans have been modest or even absent (28-30). However, one of the most common α2-adrenergic receptor agonists, clonidine, was the focus of these studies and the results were inconsistent in DM patients (26, 28, 31, 32). The analgesic effect on postoperative pain (33) has the potential to suppress a transient stress response. The analgesic effect of DEX is not dose dependent and the ceiling effect is known to occur at a dosage of > 0.5 μg/kg (34). Although the DEX dose used in this study was small, it was high enough to produce an analgesic effect. Thus, it is likely that an analgesic effect was associated with maintaining constant postoperative glucose levels in the DEX group without hyperglycemia. It is also reasonable to expect a reduction in hypoglycemic risk in DM patients during the fasting period but any association in this regard was found to be weak in this study. This was a pilot study involving a small number of patients. Thus, the potential for statistical significance was reduced. The insulin level itself was not evaluated. Thus, the effect of DEX on insulin secretion was unclear. Therefore, an additional well designed study is required to clarify the mechanism by which glucose levels change following DEX infusion in DM patients. Such a study would need to include a planned diet and test dates involving a greater number of patients. In addition, a recommended continuous infusion dose without a loading dose was used in our study. However, the administration of DEX can cause hemodynamic instability owing to its sympatholytic effects. The initial loading dose can increase the risk of hemodynamic complications in elderly patients who are susceptible to blood pressure changes. Therefore, a continuous infusion protocol without a loading dose has been the focus in recent studies (35, 36). It has been shown to be especially helpful in the recovery of patients with adequate pain control after TKA. As mentioned, it was difficult to conclude that the administration of DEX to DM patients affected insulin secretion. Therefore, it is our suggestion that the relief of pain and the stress response due to DEX could ensure that blood glucose levels remain stable in DM patients. It was found in this study that an intraoperative DEX infusion maintained constant blood glucose levels relative to baseline within 24 hours postoperatively in diabetic patients undergoing spinal anesthesia. Furthermore, the frequency of hyperglycemia in the DEX group (group A) was also found to be lower than that in the control group (group B). It is important that a constant blood glucose level is maintained in patients with DM. Therefore, the administration of DEX as a sedative agent is thought to be helpful in maintaining blood glucose levels in diabetic patients during the fasting period prior to surgery. Authors’ Contribution: Study concept and design: Yun Suk Choi; data acquisition: So Hui Yun; analysis and interpretation of the data: So Hui Yun; drafting of the manuscript: So Hui Yun, Yun Suk Choi; critical revision of the manuscript with regard to intellectual content: Yun Suk Choi; statistical analysis: So Hui Yun; administrative, technical, and material support: Yun Suk Choi; study supervision: Yun Suk Choi.